Niche business models like this may be the way forward for bricks and mortar retailers combating online sales. A seasonal pop-up store may not work for everybody, but clearly every traditional retail category is being challenged by online sales, and it's going to take some creative business structure changes to deal with it. Ironically, as bricks and mortar mattress retailers are playing catch-up to offer online goods, many online start-ups are now rolling out physical stores to reach more shoppers. Everybody wants to have their cake and eat it too! 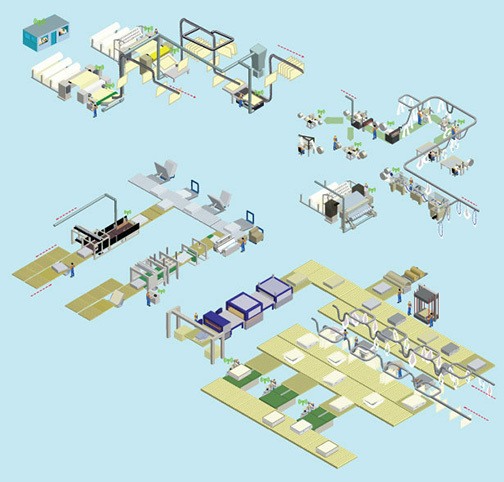 GSG can provide hyper-efficient, flexible mattress manufacturing throughout your plant. As your retail channels diversify, it demands that your mattress manufacturing must become more sophisticated too. Diversifying sales outlets put a lot of strain on your supply chain and your manufacturing systems built for your traditional sales channels. It takes hyper-efficiency, and, more importantly, flexible production to compete in multiple sales worlds. Each channel has different demands to operate effectively. Toys 'R Us was built for a different era of shopping experience, but today's shopper is building their own shopping experience. If you're going to stick with your traditional sales methods, hang in there! GSG will be there for you, just as we always have been. But if you're ready to try some alternative business models, GSG has many new, innovative systems to help you adapt.